Paris Fashion Week Fall/Winter 2012/2013 has been full of fascinating events, thus far: There was an after-party for Alber Elbaz's 10th anniversary at Lanvin on Monday, post Elbaz's delivery of an as-per-usual creatively sophisticated collection; Kanye West on the other hand—the hip-hop-artist-turned-wanna-be-designer—unveiled his second attempt at a collection (in Paris nevertheless), that fell a bit flat, short and scattered; and lastly, Yves Saint Laurent's Creative Director, Stefano Pilati turned in his finale collection for the French fashion house on Monday, as well. Yves Saint Laurent F/W 2012/13 carries through some very strong, sharp and bold silhouettes, intertwined with textures—pulling a bit from the 70s and perhaps 80s sci-fi influences, as we see young modern replicas of Sean Young circa Blade Runner march down the runway. From architecturally angled necklines to balloon sleeves, loads of leather suit jackets penetrated the runway. Power suits, robust heeled shoes and boots, dresses in mesh materials, bare-criss-crossed-backs and cuff bracelets were all there to make a collective message by YSL’s Creative Director, Stefano Pilati: The YSL woman is a modern day warrior with an afterthought of sexiness for this up-coming Fall/Winter of 2012. Pilati’s last collection for the YSL, whose tenure lasted for over eight years, required marvel, awe and of course, a standing ovation was indeed in order—much like his run as the creative mind behind the luxury brand's aesthetic for most of the last decade. Have a watch at the full show (featured above), as well as samples of the Pilati's last YSL collection (below). 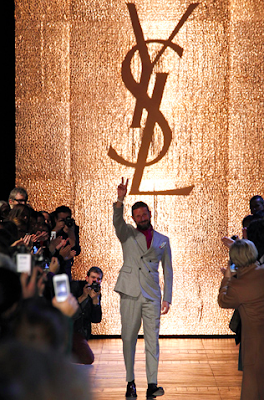 Plus see the bonus featured video (right) to see the Italian designer at his last day on and behind the YSL runway.